Hier nun wie angekÃƒÆ’Ã‚Â¼ndigt, der zweite Teil meiner Arbeit mit dem grandiosen April Kit von Scrapmuse. 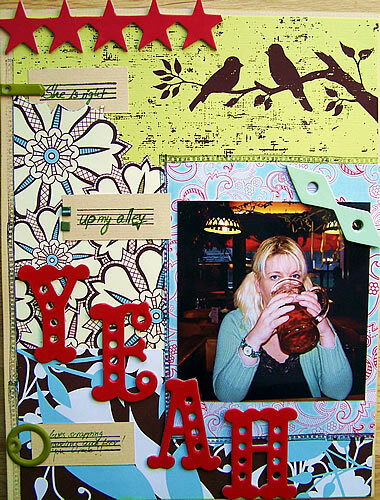 Here comes the second part of my work with the awesome april kit from Scrapmuse. Das ist das Photoswap Layout fÃƒÆ’Ã‚Â¼r unsere Kimmy – hach war das schÃƒÆ’Ã‚Â¶n, sie zu treffen! 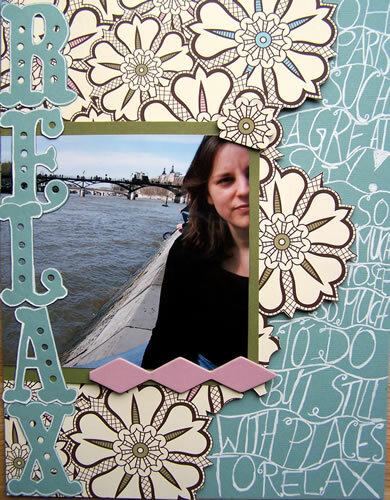 This is our very own Kimmy – we did a photoSwap and I so loved those papers that I thought it would be cool do create a layout with them for her. Journaling says: She is right up my alley. Loves scrapping, traveling and beer. You rock!! Diese Karte habe ich aus der Verpackung der 7Gypsies Embellies im Kit fÃƒÆ’Ã‚Â¼r meine Freundin Karen gemacht. I made this out of the 7Gypsies Package in the Kit as a B-day card for my friend Karen. Das sind meine Schwiegereltern bei unserer Hochzeit in Deutschland. Dieser Tag war gleichzeitig ihr 47. Hochzeitstag. My parents in law on our wedding day in Germany. This day had been also their 47th anniversary. The journaling reads: After all those years – there are still those gestures that amaze me. I love this and I hope we will do this too when we are as long together as you are. Ich habe zwei der C-Buchstaben von Lil Davis als Rahmen fÃƒÆ’Ã‚Â¼r das JOurnaling verwendet. I used two of the C’s from the Lil Davis Letters in the Kit to “frame” the journaling. Noch ein Paris-Photo. Hier habe ich die Buchstaben auf Cardstock nachgezeichnet und dann ausgeschnitten. Another photo from Paris. I traced the Chipboard letters on Cardboard. 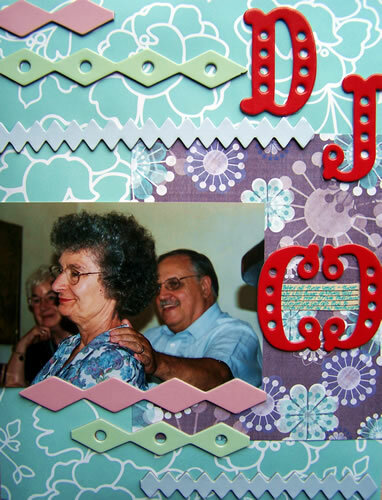 The flower paper is mounted on foam so it adds more depth to the layout. Journaling reads: Oh Paris, such a great city! So much to see, so much to do but still with places to relax. I hope you like those layouts – I wish you a scrappy day – LOL. 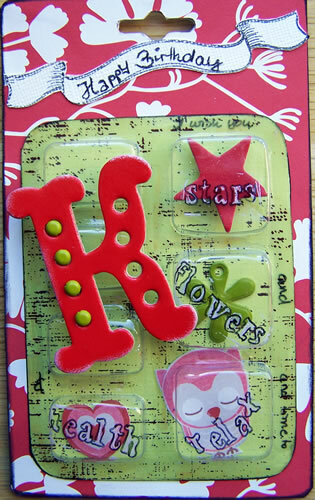 Wow – so much eyecandy again – esp- love the Kimmy-LO and the packaging-card – really cool!!! wow you’ve been busy, lot’s of fun lo’s ! Holy moly! I love love that package card! How cool! Great layouts! Love the paper and the bright colors!